The Discmania X-Line P2 Psycho is a slightly overstable beadless putt and approach discthat is significantly more stable than its older brother the P1. Targeted especially for pro-players, the P2 works great for wrist-putts and fade-in shots inside and outside the circle. 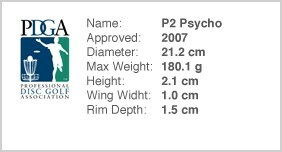 Due to its stability the P2 works great for approaches and can even tackle strong headwinds. This disc golf disc is also a very consistent driving putter. X-Line - An extra grippy blend of plastic, awesome in all weather conditions, stays true when it’s cold and wet outdoors, for year-round disc golf. "...The disc has very little low speed turn but can still handle power for driving without turning over..."